Lapsang Souchong is a type of black tea made from the larger leaves of the tea plant, farther away from the bud. The leaves are smoked over pine fires, giving the tea unique qualities that are anything but subtle. 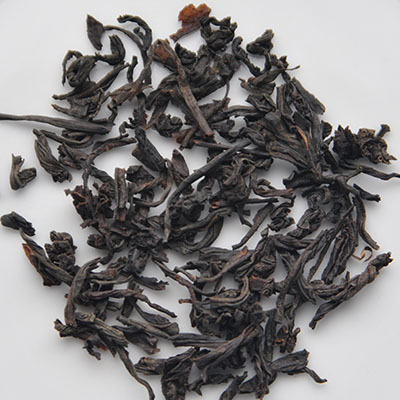 This type of black tea has a distinctive smoky quality because of the way it is produced. The tea leaves are dried over fires of pine wood, resulting in very dark-colored leaves with a strong smokey taste and smell. The tea is described as intense, powerful, and edgy. 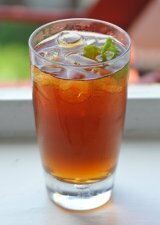 Good quality Lapsang is not brash, but instead has a smokiness that is sweet and refreshing and compliments, but does not overwhelm, the natural black tea taste. This is a unique tea that may turn off some and be a nice break from the ordinary for others. Find out more about this smoky tea. Check out a review for Adagio's Lapsang. According to the legend, in a Wuyi Mountain Village during the Qing Dynasty, the systematic drying of tea leaves was delayed by a passing army camping out in a tea factory. Anxious to finish the tea production, tea growers sped up the process of drying the tea leaves by placing them over a fire made of pine wood. As a result, the tea has a distinctive flavor or pine smoke. Some say this is the very first black tea. It is also said that Winston Churchill had a preference for Lapsang Souchong tea.